Weight: Average weight of 10-16 oz. What does a Dove look like? There are as many as 28 pigeon color types. 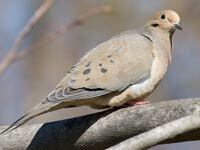 Dove's have colorful, iridescent neck feathers which are called a "hackle." Adult males and females look alike, but a male’s hackle is more iridescent than a female’s. 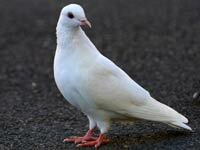 Pigeons that are all white are usually albinos. 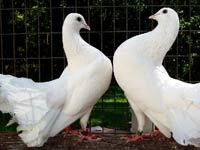 These white "doves" are frequently released during ceremonies to symbolize love and peace. Doves live pretty much everywhere, except where the climates stay extremely hot, and extremely cold. You will not find them in areas that are highly elevated. Most are found in tropical forests, and woodlands. They can also be found in grassland areas, and mangroves. Doves mainly eat seeds. That's what their diet is mostly made up of. They also eat weeds that form along fences, and the seeds they eat are usually from cultivated fields. Did you know about these Dove facts? Dove's have been around for a long time – long before humans. They originated several million years ago in Asia. Dove's can hear sounds at much lower frequencies than humans can, such as wind blowing across buildings and mountains, distant thunderstorms and even far-away volcanoes. 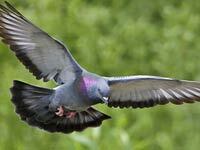 Sensitive hearing may explain why pigeons sometimes fly away for no apparent reason. Dove's can fly up to 40 or 50 miles per hour and may fly as far as 600 miles a day. They seem to be able to detect the Earth’s magnetic fields. This magnetic sensitivity, along with the ability to tell direction by sun, seems to help pigeons find their way home. Download free Dove wallpapers, click on the image to open the large version. Print free Dove coloring pages, click on the image to open the large version.